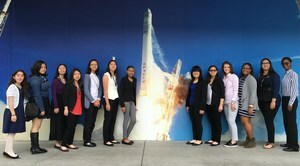 NDA Rocketry Students tour SpaceX. Members of the Rocketry Class were given a private tour of the SpaceX facility in Hawthorne. NDA students spent nearly 2 hours observing and learning about the components that comprise the Falcon 9 rocket and the Dragon spacecraft. This tour came a day after SpaceX's third successful first-stage landings on a drone ship in the Atlantic. SpaceX was founded for human space travel and some of these NDA students may help that happen!